PAGE 16 JEWISH PRESS of PINELLAS COUNTY FEBRUARY 9 22, 2018 CEMETERY LOTSAdvertise in Business & Professional Directoryfor as little as $38 per issue including web.For more information, call (727) 535-4400 WANTED: Adults with a desire to befriend a Jewish youngster. As a mentor/role model Community Services, (727) 450-7278. COMMUNITY SERVICES VOLUNTEER OPPORTUNITIESCOULD YOUR CHILD USE ANOTHER ADULT IN THEIR LIFE? Do you have children between the ages 6 who would at (727) 450-7278, for more information. CLASSIFIEDS ADS services and merchandise advertised, nor screens advertisers. All ads must be submitted in writing. $10 for 15 words, 10 each additional word. 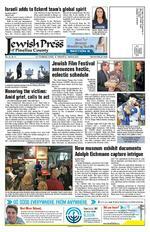 Organizations POSITION AVAILABLEJEWISH PRESS has OPENINGS for:SUMMER INTERNS include writing assignments and Karen Dawkins, managing editor PO Box 6970, Clearwater, FL 33758 email: jewishpress@aol.com. or call, (727) 535-4400 or (813) 871-2332. SERVICESACCOUNTANT SINGER CONSULTING: T woWO L awnAWN C ryRY P tsTS : Â Â Bnai BrithHorsing around fundraiser: Greater Tampa Bay Bnai Brith will be going to Tampa Bay Downs on Sunday, March 25 at 11 a.m. for its annual fundraiser. A full brunch will be offered from noon to 3 p.m. The cost is $50 per person and Â includes admission to the track, racing program, brunch and gratuities. RSVP to Arlene Berger by March 11. For RSVP information, call Berger at (727) 726-9579.JWIFor the kids: Jewish Women Inter national North Pinellas will enjoy brunch as they hold a fundraiser for the Childrens Home on Sunday, April 22 at 10:30 a.m. with a Table for Two demonstration by Chef Warren Caterson. The event will be at East Lake Woodlands Country Club, with valet parking. The cost is $38 per person. For more information, contact Amy Richman at Â richman.amy52@gmail.com or ( 727) 543-0108.HadassahGiving event: Celebrate the Power of Women Who Do at St. Petersburg Hadassahs annual giving event on Thursday, March 8 at 6:30 p.m. at the home of a Hadassah member. Hear from Diane Issenberg, coordinator of the National Hadassah Development Division, as you learn, then nosh, and shmooze while supporting saving lives through Hadassahs research. Major donors, Keepers of the Gate, mem bers of the Chai Society, and Legacy Donors also will be honored at the event. Hors doeuvres and desserts will be served. Your check ($25) is your reservation. RSVP immediately to Laurie Reiskind at lauriesr@ tampabay.rr.com. Those who can not attend the event can still donate by contacting Patricia Levinson, fundraising vice president, at plevinson@ hadassah.org. Meet the author: The North Pinellas Chapter of Hadassah will meet on Monday, March 19 at 11:30 a.m. at Temple Ahavat Shalom, 1575 Curlew Road, Palm Harbor, to hear author Marilyn Whelan, speak about her book, Caviar Living on Fish Stick Money. This book is a guide to home-spun lessons from a life well-lived. She will offer some ideas to help you stretch your money and enjoy life to the fullest. Bring your lunch. Drinks and desserts will be served. For more information, call Janice Caine at (727) 726-3735. Genealogical SocietyImmigration research: The Jewish Genealogical Society of Tampa Bay will offer the second of Â a two-part seminar titled: Â The JGSTB 2018 Guide to Immigra tion Research: Why You Cant Find Your Bubbes Immigration Record on Sunday, March 11 at 2 p.m. at Gulf Coast Jewish Family & Community Services, 14041 Icot Blvd., Clearwater. This seminar will enable participants to discover their familys immigration records. The presentation will concentrate on both traditional and recently available internet resources. Â Dr. Emil H. Isaacson who will lead the seminar, has more than 33 years of experience in genealogy. The seminar is free to members; non-members $25 for individu als or $35 for a family, which will include an annual membership. To pre-register for the class or for more information, call Bruce Hadburg at (727) 796-7981. Young Adults #Gather offers a mix of social and interactive activities designed to help young adults connect. It is open to young adults of all faiths and backgrounds. For more information or to RSVP for any #Gather events, visit: www. bryanglazerfamilyjcc.com/gather or contact Lisa Robbins at lisa.robbins@jewishtampa. com or (813) 769-4723. Wearable art: Take your rummaging skills to the next level at a Junk Box Jewelry event on Wednesday, March 7 from 6-9 p.m. at the visual arts center in the Bryan Glazer Family JCC in Tampa. Choose from a variety of unsuspecting items to combine, alter, fabricate and recombine into wearable jewelry. Dig through a treasure trove of metal, parts, pieces, leather, hinges, springs, zippers and other found and recycled options to create your very own piece of original jewelry. Bring snacks and wine to share during social hour. The cost is $10.Job-LinksMonday Morning Links: Free sessions of Monday Morning Links are offered at the Jack Roth Center for Career Development at TampaBay-Job-Links, 4100 W. Kennedy Blvd., Suite 206, Tampa from 9:30 11 a.m. On March 5 the topic is How to Write a Robot Friendly Resume; the March 12 topic is 7 Keys to Take Charge of Your Interview; the March 19 topic is Linked-in From a Recruiter Perspective and the March 26 topic is Staying Motivated During Career Transition. Monday Morning Links is supported by the Vinik Family Foundation. Job-search aids: There are Success workshops on select Thursdays to aid with job-search skills. On March 8 from 9:30 a.m. to 1 p.m. the topic is PeopleMap Understanding the Fort Personality Types; on March 15 from 9:30 a.m. to 12:30 p.m. the topic is Is Your Network Working for You and on April 1 from 9:30 a.m. to 12:30 p.m. the topic is Customize Your Resume for the Job You Want. The workshops are free for Â TampaBay Jo b-Links Â ful l program participants and $15 for guests. Reservations required for all programs. To RSVP, call (813) 344-0200, email Â RSVP@TBJL.org. Special event: On March 22 from 9:30 a.m. to 2 p.m., photographer Allie Serrano for be on-hand for a photo shoot for job seekers. Support groupsAlzheimers caregiver group: Menorah Manor offers a support group meeting in the Samson Nursing Center at Menorah Manor, 255 59th St. N., St. Petersburg, on the Â For more information, call Gwen Kaldenberg at (727) 302-3750. PAGE 18 JEWISH PRESS of PINELLAS COUNTY FEBRUARY 23 MARCH 8, 2018 Tampa Bay Jewish Film Festival ScheduleWEDNESDAY, MARCH 21 OPENING NNIGHT Bye Bye GermanyBryan Glazer Family JCC Cocktail hour 6 p.m., Theater opens 7 p.m.Bye Bye Germany is an awardÂ THURSDAY, MARCH 22 HHILLSBoORoOUGH CoOUNTY And Then She Arrived Villagio Cinema of Carrollwood, 11 a.m.Â And Then She Arrived Â Â Mr. Predictable Â The Womens Balcony Bombshell: The Hedy Lamarr Story Villagio Cinema of Carrollwood, 1 p.m.Bombshell Sammy Davis Jr.: Ive Gotta Be MeAMC Classic Centro Ybor, 5 p.m.Â Sammy Davis Jr.: Ive Gotta Be Me Â Heather Booth: Changing the World Bryan Glazer Family JCC, Theater 1, 6:30 p.m. Heather Booth will lead an open LongingBryan Glazer Family JCC, Theater 2, 8 p.m. Â Longing. PPINELLAS CoOUNTY The Last Suit Largo Central Park Performing Arts Center, 7 p.m.A dessert reception will follow the movie. Sponsored in partnership with Federation of Jewish Mens Club and Men of Reform Judaism. FRIDAY, MARCH 23 HHILLSBoORoOUGH CoOUNTY The Cakemaker Villagio Cinema of Carrollwood, 1:30 p.m. Cake and coffee will be offered Budapest Noir AMC Classic Centro Ybor 10, 5 p.m.Â Budapest Noir PPINELLAS CoOUNTY And Then She Arrived AMC Classic Palm Harbor 10, 11 a.m. Budapest Noir AMC Classic Palm Harbor 10, 4 p.m. SATURDAY, MARCH 24 HHILLSBoORoOUGH CoOUNTY The Testament AMC Classic Centro Ybor 10, 7:30 p.m. The Testament PPINELLAS CoOUNTY In Between AMC Sundial 20, 7:30 p.m. An Israeli Love Story AMC Sundial 20, 9:30 p.m.
JEWISH PRESS of PINELLAS COUNTY PAGE 19 FEBRUARY 23 MARCH 8, 2018 rfntbrtrf rfntbrtfrttf ttrtrrtft ntrfftf rf rfnftfbfrn tbrrrf n nr fft fr frrbfbrfr trfftf t ntt rfbf trftbrtt rrtfrrtrftbrtt rfftrftbrtt rfbff f tb brt tfrf trrf bf f n bf t rrfb ftf rf f FESTIVALThe year is 1947. Eighteenyear-old Margalit lives in a settle ment in northern Israel. One day she meets 24-year-old Eli Ben Zvi. She tries to get close to him, but things dont go so smoothly. He has a girlfriend and is busy with the dramatic events preceding the birth of Israel. Slowly the barriers come down, Eli discovers Margalit and they move in together. They set up a date for their wedding, but Israels harsh reality intervenes. Admission: $10 SUNDAY, MARCH 25 HILLSBOROUGhH COUNTY Scandal in Ivansk Glazer JCC, Theater 1 10:45 a.m.In the small Polish town of Ivansk, most of the Jews were killed by the Nazis, and the headstones in the Jewish cemetery were plundered for construction purposes. A group of descendants of Ivansk Jews restore the towns cemetery, retrieving what headstones they can. When they commission a plaque that includes the word collaborator, a national scandal is unleashed. This eyeopening documentary strives to understand why much of the nation wont accept collaborator to describe Polish people who aided genocide of Jews. Admission: $10Dreaming of a Jewish Christmas Glazer JCC, Theater 2, 1:30 p.m.In an irony of ironies, it was Jewish immigrant outsiders Ir ving Berlin, Mel Torm and many as a secular and inclusive cultural phenomenon. Penning such yuleLet It Snow and Rudolph the Red-Nosed Reindeer, these artdays through musical merriment. A panoply of performers delivers renditions of these beloved melorestaurant, while musicologists, religious leaders, comedians and others add insights into the contradictory and poignant relationship American Jews have with The Most Wonderful Time of the Year (also written by a Jew). Admission: $10. Kosher Chinese buffet lunch beItzhakGlazer JCC, Theater 1 2:30 p.m. Â examines the life and glorious music of Israeli-born Itzhak Perlman, widely considered the greatest living violinist. Ar chival materials and performance clips, including a breakthrough appearance on Â Â at age 13, combined with behind-the-scenes moments of the venerated artist. Perlmans musical discipline contrasts with an intimate view of his home life, as a modern Jewish family embraces its heritage in a changing world. Admission: $10Heading Home: The Tale of Team IsraelGlazer JCC, Theater 2, 4 p.m. Heading Home charts the under dog journey of Israels national baseball team competing for the the worlds best in 2017, eligible to play in the prestigious international tournament. Their line-up included several Jewish American major league players, most with a tenuous relationship to Judaism, and never having set foot in Israel. Their odyssey takes them from Tel Aviv and Jerusalem where they are greeted as heroes, to Seoul where they must debunk their has-been, wannabe reputations. raels roster) Alex Jacobs after Admission: $5 for kids, $10 for adultsThe People vs. Fritz Bauer Glazer JCC, Theater 1, 6 p.m. postwar 1950s, Germany grows increasingly apathetic about confronting its recent past. Against this backdrop, the implacable Attorney General Fritz Bauer (Burghart Klaubner) is committed to holding leaders of the Third Reich to account. He is stymied at every turn by authorities with Nazi ties, now in top government positions. While slandered in the court of public opinion by foes seeking to silence him, the tenacious Bauer pursues a forbidden alliance with Israeli spy agency Mossad to apprehend Holocaust mastermind Adolph Eichmann. Admission: $10 to sell-out this year, so pre-pur chase of festival tickets is suggested at www.tbjff.or g. For more the ad on Pages 10-11 or go to the website. The 2018 festival is co-produced by Tampa sponsored by the Florida Department of State Trust and Sara and David Scher. To become a corporate sponsor or patron of the Tampa Bay Jewish Film Festival, call (813) 769-4725 or visit the website.